Today is the end of my two week half term. This is something my school has had long before I started in 2005 but this year it seems that more schools are adopting the idea too. Our school has always had the additional week to reduce the long summer holiday. We are a specialist special needs school and for our students and families the long summer holiday can be challenging with changes in routine, respite care etc.. and our shorter holiday does help. I have always liked this two week holiday, before children we often went on sunny holidays or visited family and then I would have time to potter and relax. Now the first week of the holiday is spent en famille and the second week gives me some very rare me time as the children return to school. It is a week I really look forward to, I start my Christmas planning, do any little jobs I’ve been meaning to do in the house, meet friends, do a few trail runs if the weather allows and enjoy simple pleasures, a trip to the cinema, reading etc.. It is lovely to have that me time and although the week in summer takes a little organising, it’s workable in our family, particularly with my part time hours. 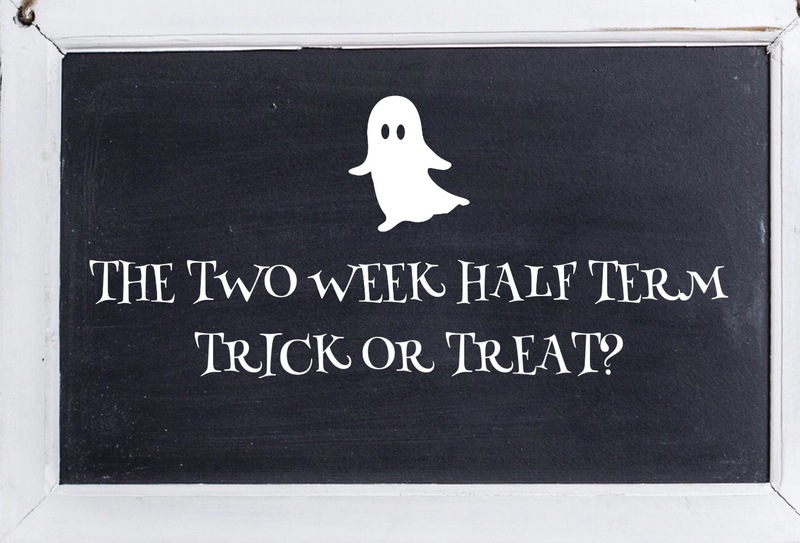 However, I was thinking what if my children had a two week holiday in October and less in the summer? Whilst it works for me, I’m not too sure it would work for the children. The summer holiday should be sunny and warm and it is easy and cheap to keep the children amused on the beach or in the park. There are long days and evenings, lots of time to be outside, to play, to swim, to relax. At the end of October, there are fewer opportunities for outdoor activities, days are shorter and it would be costly to fill a two week holiday with trips to the cinema, indoor skate park, swimming and other sports. More school in July would mean hot and stuffy classrooms, lots of distractions and very tired children. Our school’s curriculum in the summer is specifically designed for our students, with lots of outdoor activities, enrichment and project work to compensate for the later finish, generally our formal learning finishes at the start of July. Whilst I like my two week holiday, I would prefer that my children have a week half term and continue to have the traditional long summer holiday with time for summer adventures at the beach and to enjoy the warmer weather outside. It’s an interesting debate on how to distribute the thirteen weeks school holidays to best suit pupils, staff and families.